« Tropical Sangria–It’s Low Calorie! Rice Krispie Flowers in a Pail of Pudding! As I write this, it’s early May, and flowers are bustin’ out all over. Gardeners are flocking to stores to buy their bedding plants, and those tender, colorful blossoms just make you happy, don’t they? Years and years ago, my sister-in-law gave me a recipe for Dirt Pudding. You’ve probably had it before, it’s that good. 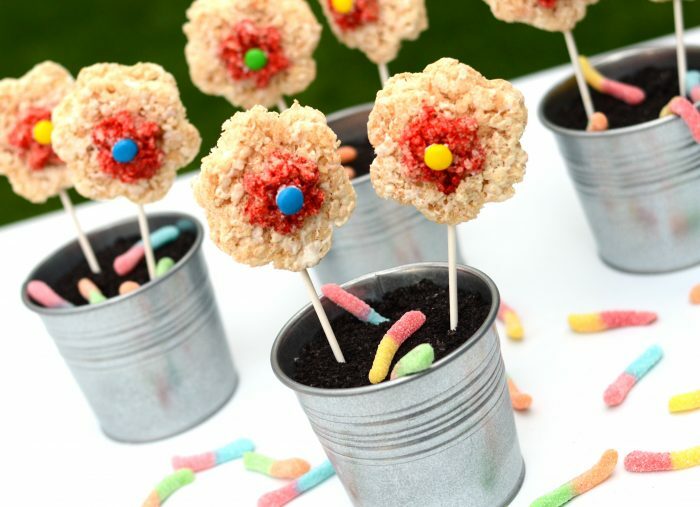 And for my little granddaughter’s 3rd birthday this weekend, I made these fun Rice Krispie flower pops and plunked them into cute pails of Dirt Pudding to help her celebrate. All her cousins were quick to help her eat them, let me tell you. I kept back a good-sized handful of the Rice Krispie treats and kneaded in a few drops of food coloring. Like above, I spread to about 1/4 inch high and cut out smaller shapes for the centers. When the large flowers cooled and firmed up, I dabbed some frosting on the rough side, laid the sucker stick on it, and sandwiched it with a second flower, rough side on the inside as well. That way, the outsides of the flower were smooth (after having been pressed onto the parchment.) Attach the colored centers with another dollop of frosting. Add a colorful M & M and hold in place with a dab of frosting, too. Let set until just before serving. Melt butter over low heat in large saucepan. Add marshmallows and stir until completely melted. Remove from heat. Add Rice Krispies, stirring until well coated. Crush cookies into fine crumbs. Melt butter and mix into cookies. Cream the cheese. Add sugar, pudding and milk. Mix well. Note: Makes enough for 13 x 9 pan. Divide cookie crumbs in half, layer in pan, add all of pudding, then top with remaining crumbs. 2 Responses to Rice Krispie Flowers in a Pail of Pudding! So, so cute! What a wonderful grandma you are, Pam! You are really amazing. Thank you, Rosie! You’re pretty special yourself–and always a great cook!